The huge amounts of data produced by a new generation of radio telescopes will change the way we see the universe. 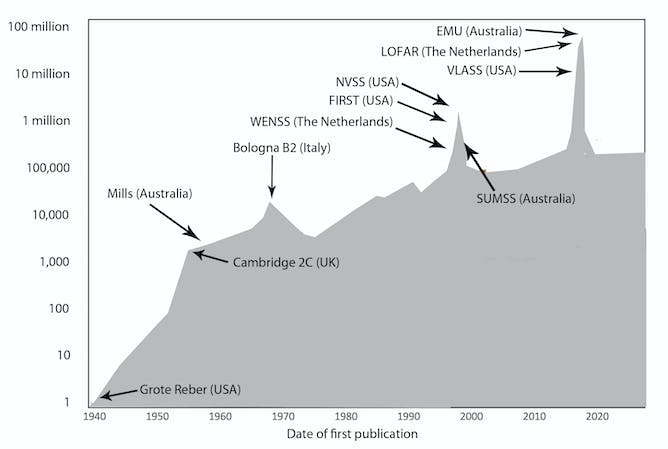 But once that data is scrutinised it could lead to some amazing new discoveries, as I explain in my review of the state of radio astronomy, published today in Nature Astronomy. Over the next few years, we will see the universe in a very different light, and we are likely to make completely unexpected discoveries. 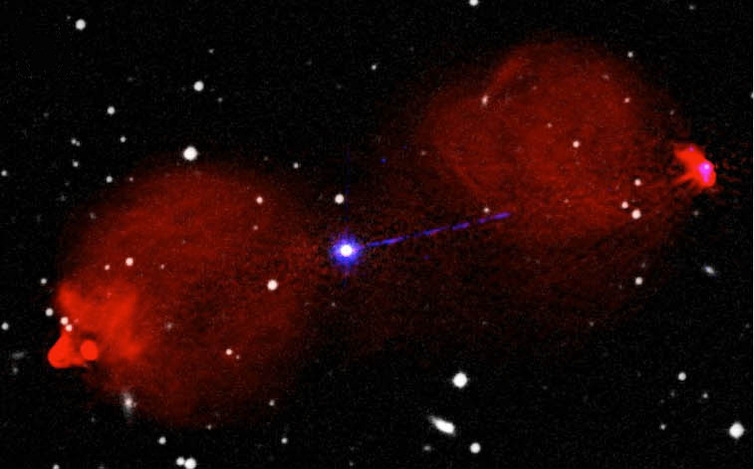 Radio telescopes view the sky using radio waves and mainly see jets of electrons travelling at the speed of light, propelled by super-massive black holes. That gives a very different view to the one we see when observing a clear night sky using visible light, which mainly sees light from stars. Black holes were only found in science fiction before radio astronomers discovered them in quasars. It now seems that most galaxies, including our own Milky Way, have a super-massive black hole at their centre. Radio waves from space were detected by the American Karl Jansky in the 1930s. Since then, radio telescopes – such as the 64-metre dish at Parkes, in New South Wales – increased the number of known radio sources in the sky from one (in 1940) to a few hundred thousand. Then, around the turn of the millennium, four projects driven by new technology suddenly increased the number of known radio sources from a few hundred thousand to about 2.5 million. They were the Westerbork Northern Sky Survey (WENSS, NRAO VLA Sky Survey (NVSS, Faint Images of the Radio Sky at Twenty-cm (FIRST and the Sydney University Molonglo Sky Survey (SUMSS in The Netherlands, United States and Australia. For almost the next two decades there was no significant increase in this number, because nobody could significantly improve on what those four projects had done. A group of new telescopes in Australia, The Netherlands, the United States, India and South Africa are about to unleash new technologies that will generate another surge in our knowledge of the radio sky. 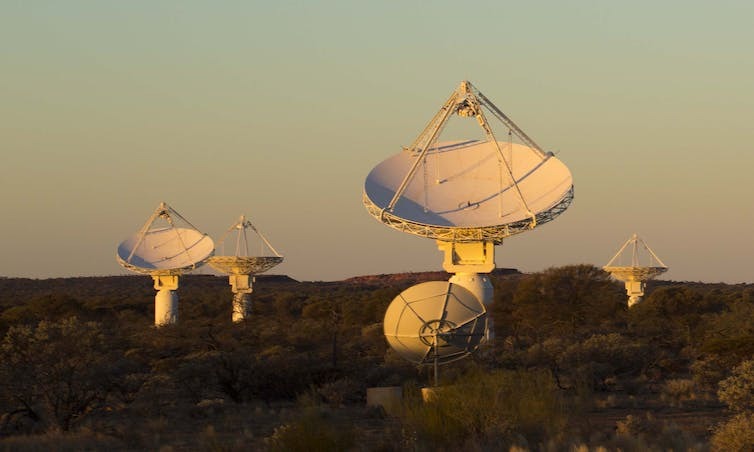 Leading them, in terms of numbers of sources, is Australia’s Evolutionary Map of the Universe (EMU) project, running on CSIRO’s new A$188-million Australian Square Kilometre Array Pathfinder (ASKAP) telescope in Western Australia. For ASKAP, the new technology is CSIRO’s revolutionary phased array feed, which allows ASKAP to view enormous areas of the sky at once. As a result, EMU alone will raise the number of radio sources to about 70 million, compared to the 2.5 million sources discovered so far by all radio telescopes in the world over the entire history of radio astronomy. This huge surge in humankind’s knowledge of the radio sky has several consequences. 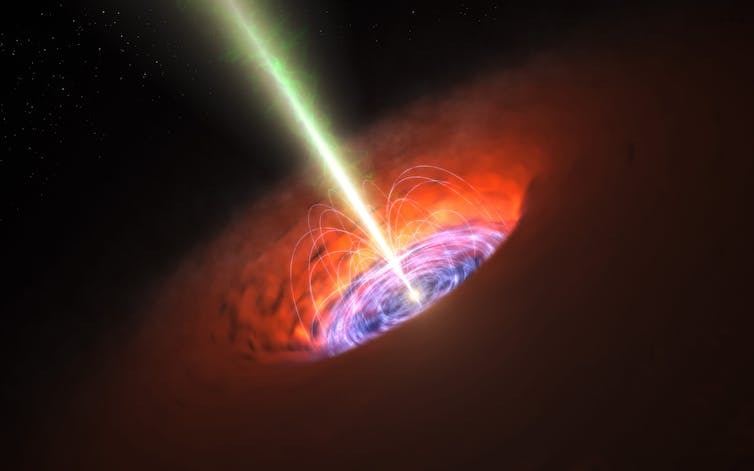 First, we expect to answer some of the major questions in astrophysics, such as understanding why super-massive black holes seem so common in the universe, how that regulates the growth and evolution of galaxies and how galaxies swarm together to form clusters. Second, it will change the way we do radio astronomy. At the moment, if I want to know what a galaxy looks like at radio wavelengths, chances are I’ll have to win time competitively on a major radio telescope to study my galaxy. But I’ll soon be able to go to the web and observe my galaxy in data already collected by EMU or one of the other mega-projects. So most radio astronomy will be done by a web search rather than by a new observation. The role of major radio telescopes will change from finding new objects to studying known objects in exquisite detail. Third, it will change the way that astronomers do their astronomy at other wavelengths. At the moment, only a small minority of galaxies have been studied at radio wavelengths. From now on, most galaxies being studied by the average astronomer will have excellent radio data. This adds a new tool that can routinely be used to uncover the physics of galaxies, opening wide the radio window on the universe. Fourth, having such large volumes of data changes the way we do science. For example, if I want to understand how the gravitational field of nearby galaxies bends light from distant galaxies, I currently find the best single example I can, and spend night after night on the telescope to study the process in detail. In future, I will be able to correlate the millions of background galaxies with the millions of foreground galaxies, using data downloaded from the web to understand the process in even greater detail. Fifth, and probably most importantly, history tells us that when we observe the universe in a new way, we tend to stumble across new objects or new phenomena that we didn’t even suspect were there. Pulsars, quasars, dark energy and dark matter were all found in this way. How numbers can be massaged. The ASKAP telescope in Western Australia will collect the mysterious high energy signals known as fast radio bursts with unprecedented ease. The traces of the first daybreak in the universe have been detected by a small radio-telescope.